I had never been to the Young Vic before and was delighted by how easy it was to find from Waterloo Station – a mere 3 minutes walk – and had a good look at the Old Vic too. Getting there in plenty of time before the performance started, we were treated to a ‘pre-performance journey’ by walking through the back stage area intriguingly decked out in the pale sage green of psychiatric Hospitals, complete with stains and shabby equipment. Faded signs adorned the wall and everywhere there were the indications of a decaying, underfunded, understaffed National Health Facility. Locks and doors and echoing corridors suggested a Psychiatric secure unit with the sense of quiet, musty despair that pervades such places, even in the face of the blinding fluorescent tube lighting. Having visited such environs before it was all strangely, unsettlingly familiar. The buzz about this production has been floating about in the theatrical ether for quite some time. 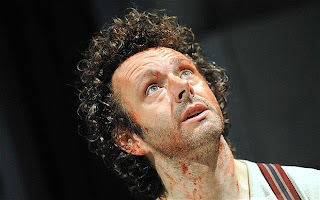 The coup de theatre of getting Michael Sheen – one of those actors who tends to garner universal praise – in one of theatres most iconic roles was pretty staggering. Tickets were sold out months and months ago and an almost frenetic energy seemed to pour out of the Young Vic Theatre as my friend and I rocked up stuffing down the last of our sarnies. We hesitantly found a way through the winding corridors, past a gym where a couple of hostile looking guys were practicing their fencing, past the Doctors rota and through the secure doors into a rust carpeted arena and headed toward the seats. The whole experience was deftly unsettling and as such set me on edge before the action began. It was this psychiatric setting which was simultaneously triumphant and yet not entirely successful. This setting , as the basic premise, gave an underling structure to Hamlet’s madness, but also raised questions about the way the characters related to each other. Hamlet’s mum – played by the terrible attractive Sally Dexter, all girlish flirtation and heavy sedation – was she a patient? Was she a staff member gone mad? How did Hamlet fit? He was clearly a patient but how did this fit his connection to Claudius? (Busily tranquilizing his mother) And who was Polonius in all this? 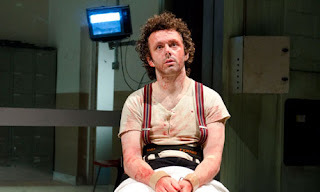 Laertes was clearly released at the beginning of the play – so was Polonius a patient? Or a porter? Or....? To be honest the setting whilst powerful in places, also raised more questions than it answered. Nonetheless, negatives aside, there was so much about this production that was outstanding. Sheen was fabulous as our eponymous anti-hero. Manic, fragile, frighteningly powerful with all the strength and terror of a man losing his mind. Indeed when he donned his dead father’s coat –left across a coffin at the beginning lowered into a grave (question, who was the father in all this? Another Doctor? A Patient? An actual relative? Gar! Too many questions!) 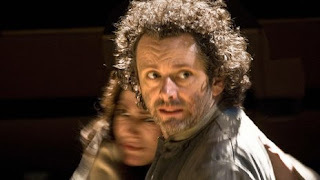 - inhabiting the ‘ghost’ role as well as the son, he became frighteningly dramatic, an almost meta-theatrical Revenger in the tale – much more effective in the role than the ‘son’ figure. His setting up of the Mousetrap was another theatrical coup - with Roy Orbison’s ‘Crying’ playing loudly throughout, building to a crescendo as the chaos mounts and our Hamlet takes a fevered bow to the audience. It was majestic. The lights cut out and cheers erupted usually reserved for the final call. There were some simple techniques which built the tension exquisitely. The darkness for the ‘ghosts’ appearance’ was marked by a flickering of the overhead lights then plunging the whole theatre into complete darkness. Simple but highly effective. Claudius’ soliloquy was spoken behind the glass observation door, and overheard on the CCTV. Apart from the doubling of the ghost and Hamlet, there was also some interesting cross gender casting. Both Rosencrantz and Horatio were played by women - in the case of Rosencrantz there seemed the suggestion she was in love with the Dane and all his mental scars. Meanwhile Horatio seemed to act in a motherly sort of way to him. Ophelia seemed to be a childhood sweetheart to his mild side - who was fiercely kissed and rejected in one fell swoop, and thus turned into her own fragile mind, singing PJ Harvey Shakespeare, wheeled around in the obligatory chair then being lowered into a sandy grave as the stage is pulled out to reveal a little patch of earth. Into this Ophelia is buried, Polonius emerges as Ophelia’s ‘churlish’ priest, then Ophelia too emerges as Osric. It is only Hamlet that sees these otherworldly figures. Unlike the Boydian universe where the dead do not stay dead, here we get the impression that the dead only stay alive in the turbulent mind of Hamlet. To add finally to the sense of chaos that envelopes the world the bodies of all the Danish ‘court’ are placed under a tarpaulin of black plastic as Fortinbras walks in, masked in black, and watched in silence, a malignant figure. As the tarpaulin finally covered everyone , the poignant piano music quietly echoing through the theatre, Fortinbras pulls off his mask to reveal : What?? 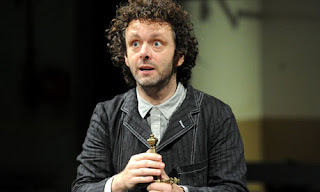 Michael Sheen???? He is Hamlet and Old Hamlet and young Fortinbras. Why? What’s going on? Then is chaos come! And with that bombshell the lights go down. Riotous applause- standing ovation - three curtain calls- not bad for a Saturday matinee. It was a suitably complex production in many ways wonderful and frustratingly close to magnificent. Sheen’s performance was a masterpiece, only just occasionally hindered by the pretext of the production. Still. Regardless of that I stood and cheered loudly as the lights went down on Elsinore.